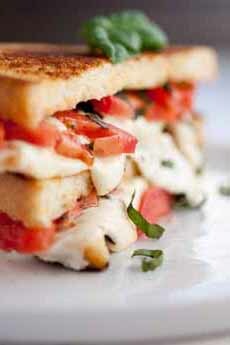  A Caprese grilled cheese sandwich made with mozzarella, tomatoes and fresh basil. Here’s the recipe from Cooking Classy. 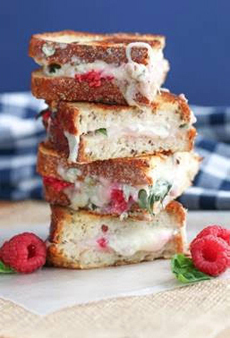 Dessert grilled cheese: queso blanco and fresh raspberries (photo courtesy Litehouse Foods). April 12th is National Grilled Cheese Day. We’re passing along these tips for a better grilled cheese sandwich from the culinary team at HelloFresh, a weekly recipe-kit delivery service..
Keep the heat on medium. This will allow ample time for the cheese to melt without the risk of burning the bread. Patience is a virtue for a perfectly toasty sandwich. Grill both sides of the bread. Not only do you get an extra toasty buttery texture when it’s finished, but the cheese will melt faster, reducing the risk of burning. Don’t be afraid to use lots of butter. Use unsalted butter at room temperature: You want it to spread evenly for a consistent result. Seasoning with salt and pepper amps up the flavor as well. Use mayo instead of butter. A technique for added texture and flavor is to spread the outside of the bread with a little mayo. You should still melt butter in the pan, but the added mayo helps to get the bread nice and crispy. Try mustard. Add a layer of mustard to the inside of the bread for a flavor boost. Get creative with toppings. Tomato slices are a favorite, as are pickles. Thinly slice them and add them to the inside for some briny crunch. If you like things hot, use sliced or pickled jalapeños. You can add caramelized onions to any grilled cheese sandwich. Add some jam or preserves Experiment with a dab of fig, peach or blackberry jam for a sweet-and-savory balance. You can add fresh fruit instead of—or in addition to—jam (photo #2). Try brie, Granny Smith apple and apple butter; blue cheese and sliced figs; gruyère/emmenthaler and stone fruits (apricot, peach, pitted cherries, plum, etc.). Add meat. Smoky or spicy meats, like bacon, pepperoni or other sausage, are great pairings. Explore different breads. You know what a loaf of white bread can do; try something else. A rustic loaf? Challah? Add fresh herbs. We particularly like basil, cilantro, chives, oregano, thyme and/or parsley. Add more cheese! In addition to extra cheese, consider a second cheese for a combination flavor. You can also sprinkle some parmesan on top of your main cheese. Use your imagination, and you’ll leave that American cheese on white bread a memory!